Clovis Unified School District Career Technical Education Vision and Mission statements were recently created by a team of teachers, counselors, and administration. Our Vision - To strive to be America's leader in exemplary Career Technical Education. Our Mission - Clovis Unified School District provides innovative Career Technical Education through high quality, rigorous educational pathways developed in partnership with business and industry allowing students to pursue their passions while becoming college and career ready. Career Technical Education are educational pathways that focus on a specific industry field. Students take all the required courses necessary for graduation and/or college entrance, but their electives focus on an industry field that they have an interest in possibly working as a career. In these classes, students learn real life technical skills based on industry standards. Courses are project based and can be very rigorous while at the same time exciting and fun. 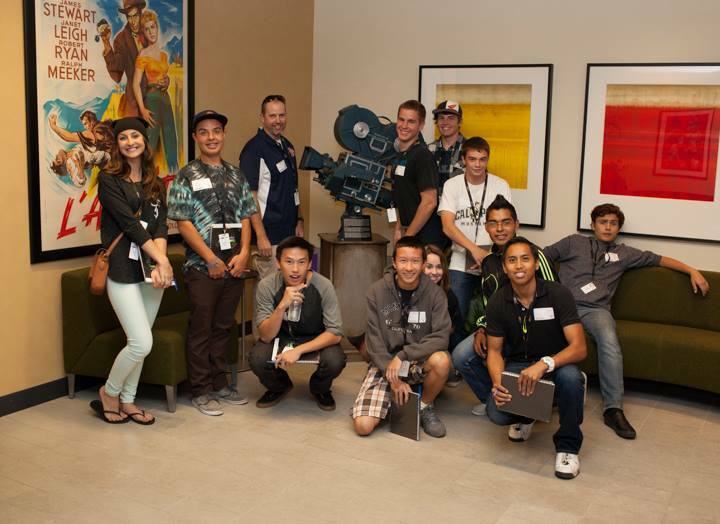 Several classes take field trips to the industry they are studying. Students earn industry certifications in most of the pathways, work in community classrooms (meaning out of school in a professional field), and in some courses earn college credit. Buchanan currently offers other CTE courses that are not currently in a pathway. They still are project based courses and teaches real world skills that can be used in securing employment after high school. These courses include Basic Auto, Basic Woodworking & Intermediate Woodworking. Buchanan's goal is to see that all pathways will in the near future earn some type of college credit in their pathway. What is a Pathway and which ones are offered at Buchanan? There are 15 Sectors in CTE (Career Technical Education) and within each Sector are different Pathways. A Pathway will have an introductory class, a concentrator course (more detail), and a capstone course (which includes community classroom, internships, high level skill development, & certifications). Patient Care - Focus on Sports Medicine, Athletic Training & we are currently writing an intro course Allied Health. Kelly Bettencourt is a Certified Athletic Trainer who received her degree from California State University Fresno in Kinesiology with an emphasis in Sports Medicine. She earned her credential from Fresno Pacific University. Kelly was certified as an Athletic Trainer in 1999. She worked in physical therapy for a couple of years, then worked for OmniMotion (a durable medical company) for 6 years before opening her own athletic training business and running it 2005 to 2014. Her passion is teaching juniors/seniors all aspects of the sports medicine fields so they can decide if they want to pursue a career in Athletic Training, Physical Therapy, and Fitness. Real life skills. She is married and has three kids, Jake 13, Chris 10, and Allyson 8. George Bonanno has his B.A. in Social Science from ASU. He has a Masters in Higher Education from Ashford University and a Masters in Teaching from National University. He worked in the food service and hospitality industry for over twenty years. He has owned three restaurants and a catering company. He also has a Real Estate License and purchases investment properties part time. He has been coaching high school football for twenty eight years and is enjoying his second career as an educator. He looks forward to working with his students and considers his teaching career as the most fulfilling job he has ever had. He is starting his fourth year at Buchanan and looks forward to twenty more. Sara Hanson loves being a teacher and her favorite aspect of the job is hearing the new and exciting perspectives of her students as they delve into learning about the field of education. Her passion for teaching began when she obtained her Bachelor’s degree in English from Loyola Marymount University and was solidified in the completion of her credential and Master’s degree in Education with an emphasis in Curriculum & Instruction at Fresno State University. In addition to her classroom duties, Mrs. Hanson is also the English department chair, a BTSA support provider, the teacher leader for the Teaching Pathway, as well as the yearbook adviser. In her free time, she enjoys reading, spending time with her husband who is also an educator and competing in horse shows. Linda Bone is a graduate of Clovis West and Fresno State. She earned a B.S. in business with an option in marketing and has a Masters in educational administration. Linda is inspired by her students who have taught her that everyone has strengths, and considers it her job to tap into those strengths, and equip them to achieve. She believes that the greatest gift in teaching is having a front row seat when a student discovers a new found passion, works hard, and achieves beyond their imagination. Linda has been married over 20 years with a daughter in 11th grade and a son in 6th grade. Sara Hanson has been working with students for twenty years to make the Endeavor yearbook one of the best in the Valley. In addition to being an English teacher, she owns and operates a graphic design and editing business, Red Ink Designs, working with various organizations in Fresno County. Mrs. Hanson was the editor on Celebrating the Journey: 150 Years of Fresno County and Beyond which details the history of our local region and was a co-author/editor on The Fresno Athletic Hall of Fame 50th Anniversary Commemorative Edition which celebrates notable athletes from Fresno County. Editing, layout and design are her passions and she shares her expertise with students interested in graphic arts. In her free time, she enjoys reading, competing in horse shows, and spending time with her husband and dog. Daniel Samarin attended UC Santa Barbara where he graduated with a Bachelors’ of Science in Mechanical Engineering and credentialed in Physics. He worked in industry for several years. Having worked as a design engineer in the wine industry, consumer products, and technical support engineer in commercial HVAC. Daniel has been in education for 2 years at the high school level. Sascha Ludwig teaches the Biological Links to Energy and the Environment. He grew up in Clovis and went to Buchanan High School, graduating class of 2009! After high school, he attended Fresno Pacific University, where he received his bachelors in Biology with an emphasis in environmental sustainability and chemistry. Sascha played water polo and swam during his time at Buchanan and Fresno Pacific. He is currently the Director of Sport for Girl’s Water Polo at Buchanan High School, and also help with swimming. He is in the process of getting my Masters in Environmental Policy through Kaplan University. Sascha shares that he loves what he does and is excited to be a Bear once again! Once a Bear always a Bear!! Richard Kinney has created, and helped develop, hundreds of science labs, projects, activities and is a long time presenter at the California Science Teachers Association Conferences, sharing the labs and activities he has created or modified. He stresses the importance of bridging the gap between science and literacy, creating many reading assignments about current science and science history to aid in preparing students to become better readers. Mr. Kinney has taught middle school physical science for 24 years and High School for 5 years. During this time Mr. Kinney earned his Private Pilot Certificate and has been a member and newsletter editor of the Central Valley Astronomers club. Mr. Kinney has coached Science fair, Science Olympiad, Lego Robotics mentored the Buchanan High School FIRST Robotics team, and represents his colleagues as a Faculty Senator. Mr. Kinney has spent the past 6 summers working with NASA and Fresno State teaching STEM to future teachers. In addition to his teaching schedule Richard was the coordinator for Clovis Unified School District’s Energy and Environmental Research Center at Buchannan High School from Fall of 2014-Spring of 2015. His current focus is to incorporate the NASA’s Engineering Design Process and Reading Apprenticeship strategies into secondary education as we implement the Next Generation Science Standards. ROP stands for Regional Occupational Program, a state-funded educational program providing career preparation and guidance to meet identified educational and industry standards with some on the job training. These classes are ideal for students that are determining their career focus, seeking a career, or enhancing their current skills. There are 15 Sectors in CTE and within each Sector are different Pathways. A Pathway will have an introductory class, a concentrator course (more detail), and a capstone course (which includes community classroom, internships, high level skill development, & certifications). To see the different CTE Pathways offered at Buchanan High School during the 2017-18 school year. Juniors and seniors have the option of taking CTE/ROP classes at any of the Clovis Unified high schools. Students attend CTE/ROP classes for two periods. Unfortunately, CUSD does not provide transportation to other school sites for any of the CTE/ROP classes. To see the Different Pathways and Detailed Course Descriptions (File) of the classes that will be offered during the 2018-19 school year.